Disaster Management Minister Mahinda Amaraweera said this time around the Government will secure the highest number of votes ever won in the history of Provincial Council polls at the forthcoming Southern and Western PC elections. The number of UPFA members will also increase. The Minister in an interview with the Sunday Observer said the UPFA would also set yet another record by securing the highest number of members elected from Hambantota district in a Provincial Council Election. 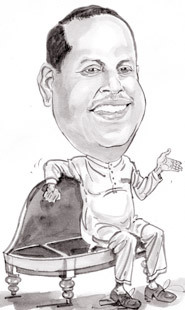 Minister Amaraweera said the UNP's Leadership Council would not make a comprehensive change within the UNP. What happened in the past was when the UNP lost an election, the party pressurised Ranil Wickremesinghe to quit from the leadership. The only change that will occur within the ranks of the UNP is when it faces the next electoral defeat, the responsibility will be vested with Leadership Council Chairman Karu Jayasuriya and other members of the council. The UNP would face the largest electoral defeat at the forthcoming Southern and Western Provincial Council Elections, he said..
Q: What is the Government stand on the Northern Provincial Council’s resolution for international mediation on human rights violations and evolving a political solution for Sri Lanka? A: TNA politics would create disharmony among communities. In a situation where mistrust among communities is narrowing, dislike for the TNA will evolve among other communities due to racial politics practised by them. The TNA is harping on past incidents which took place during the military operations against terrorists. The TNA depends on funds channelled by the Tamil diaspora. TNA drama would not bring any advantage to the country or to the Tamil community. The TNA’s attempt to create mistrust among communities would once again drag the Sinhalese and Muslims to distrust the Tamils. Now this gap is narrowed down. What is the purpose of harping on the past? Our Security Forces have not committed human rights violation as claimed by the TNA or certain international organisations. The Government will take steps to look into these matters. International intervention on our internal affairs would not be of any effect. It would once again lead to injustice to the Tamils. Q:TNA politics appears to have been radicalised due to the backing of certain Western democracies whose political bigwigs had even held secret discussions with Tamil politicians aiming at a regime change in Sri Lanka. Hasn't the political establishment taken these developments seriously? A: We have realised the motive of the Tamil diaspora and certain Western countries. Their intention is to rally round the people against the incumbent Government aiming at a regime change. We have understood their motive. The Government is aware that the people have no intention for a change in the Government. Recently concluded elections are a testimony that majority of the people have no issue with the Government. Western powers can't adopt the same strategy they adopted in Iraq, Egypt, Libya or Iraq, in Sri Lanka. Because the majority of the people support the Government and endorse the programs initiated by the Government. The TNA would deprive the opportunity created for the Tamil people to stand on their own. The Government has already developed infrastructure facilities in the North to a great extent while steps have also been taken to improve economic conditions and overcome the problem of shelter. People in other parts of the country are bound to inquire from the Government and the President as to why a huge amount of money is being spent when the TNA is behaving in this fashion which would then lead to injustice to the Tamils. Despite the politics adopted by the TNA, the Government will continue its development drive in the North. The TNA does not reflect the Tamil voice. It is regrettable that even resolutions are passed by the TNA at the Northern Provincial Council to cater to the Tamil diaspora and some Western countries. Q: Don’t you think it is an insult to the international peace crusaders to listen to former Trincomalee LTTE terrorist leader Elilan’s wife Sasitharan preaching on human rights at the UNHRC sessions in Geneva? A: It is absurd and stupid. Sasitharan will speak in keeping with the Western countries at the UNHRC. She was also an LTTE member. Her husband is responsible for many killings and other atrocities committed by the LTTE. Sasitharan was also actively involved in LTTE activities. Therefore obtaining evidence from Sasitharan at the UNHRC sessions is akin to getting evidence from Prabhakaran so much so that if the West drafts the evidence, she will endorse it. Q: Ethanol and heroin will become the strong weapons in the Opposition’s arsenal during the forthcoming Provincial Council elections. How do you assess its impact on national politics? A: Ethanol and heroin is being seized on a large scale. This is an unprecedented change that has overtaken the country. The import of drugs and ethanol is not a recent development. Investigators are of the view that the drug racket has been going on for years. Even during the UNP era this racket was continuing. A similar situation existed after 1977. Now raids are being conducted to arrest drug racketeers. If the Government wants it can direct the relevant authorities not to arrest these drugs and ethanol stocks. When large scale raids are conducted to seize drugs and ethanol, it is a major news in the media. Various names are also connected to such incidents. Arresting drug racketeers is a bold decision taken by the Government. Even if any politician is connected drastic punishment should be given irrespective of position. If existing laws are inadequate, they should be amended and drastic action should be formulated to apprehend the culprits. President Mahinda Rajapaksa has instructed the relevant authorities to take stern measures and bring the culprits to book. Q: Do you think the UNP’s Leadership Council will recapture its vote bank at the forthcoming Provincial Council Elections and gain victory? A: Certainly not. Now ethanol and heroin is the UNP's trump card. Is this the main problem affecting the country? The UNP has so many other issues it can take up, this is so trivial. Earlier the UNP said there was no development was taking place now it has taken a different turn. This Leadership Council would not make any comprehensive change within the UNP. Earlier when the UNP lost an election, the members pressurized Ranil Wickremesinghe to resign from the leadership. The only change will be is when it is faces an electoral defeat, the responsibility will be vested with Leadership Council Chairman Karu Jayasuriya and other members. The UNP will face the biggest electoral defeat at the forthcoming Southern and Western Provincial Council Elections. Q: Today there is new JVP leadership. Since the JVP is regarded as the third force, will this leadership change improve their vote bank and political leverage? A: I don't think so. The JVP is distanced from the people now. There is no way to prevent that. However, we regret this pathetic situation faced by the JVP. It would have been good if a few JVP members were represented in Parliament, Provincial Councils, Pradeshiya Sabhas and other Local Government bodies. But the people have categorically rejected the JVP due to wrong decisions taken by the hierarchy. Definitely, the JVP's vote base will further erode at the forthcoming Southern and Western Provincial Council Elections. Q: Is the Government confident of victory at the upcoming Southern and Western Provincial Council Elections? A: The highest number of votes ever won in the history of Provincial Council Election would be secured by the Government at the forthcoming Southern and Western PC elections. The number of UPFA members to be elected to two Provincial Councils will also increase considerably. The UPFA would also set yet another record by securing the highest number of its members elected from the Hambantota district during a Provincial Council Election. Q: Since natural disasters are unpredictable, is the disaster management apparatus of your ministry adequately equipped to deal with such emergencies? A: We have improved when compared with the past. I can assure that if there is an imminent threat of a tsunami, we have a systematic program to rescue people. We have conducted rehearsals and programs to educate the people on tsunami evacuation and other natural disasters. However, the damage caused by natural disasters has also changed now. We have laid al emphasis in this area and are now in the process of taking steps regarding this. We have spent a huge amount of money to take precautionary measures to prevent the occurrence of such disasters. Instead of providing relief after a natural disaster occurrs, we have spent for flood mitigation projects and to take preventive measures to arrest landslides. Q: With drought, water scarcity and rampant poverty, the Hambantota district remains neglected. How would you contrast this dismal picture with the Government’s development drive today? A: What we witnessed in the past was water bowers carrying banners of various politicians distributing drinking water among the people of Hambantota in August every year. Water was taken even from Colombo to be distributed. Now drinking water facilities in Hambantota is developed to face droughts. I too contributed to this effort when I was the Water Supply Minister. In addition, water facilities have been provided for agricultural purposes as well. Several new water supply schemes have been implemented in Hambantota due to moves taken by President Mahinda Rajapaksa. Steps have also been taken to renovate tanks and other irrigation network in the district. Except the construction of a new port, airport and roads, massive development has n taken place in Hambantota. Poverty in Hambantota has declined while education levels have gone up. Infrastructure facilities have been developed to a great extent. Electricity has been provided to almost 99 percent of households. We are proud about the massive development in Hambantota. Earlier when the lists were formulated based on education and examination results, Hambantota was below 20 in the list. Now Hambantota has achieved a top slot.